From the homepage, select “WiFi.” Once Flter is powered on, the WiFi is automatically enabled, as this is its default setting. You can use the toggle switch to disable the WiFi manually. However, restarting Flter will automatically turn the WiFi back on. *Please note that Flter&apos;s default WiFi password (key) is shown on the sticker on the bottom of your device. Click on the eye icon to make the current WiFi password visible. Click on the eye icon a second time to hide the password again. Click on the text box that says Flter and type in the new network name you wish to use. Click on “Save” in the upper right-hand corner. Flter’s WiFi will reset, and you’ll then have to manually rejoin the renamed network. 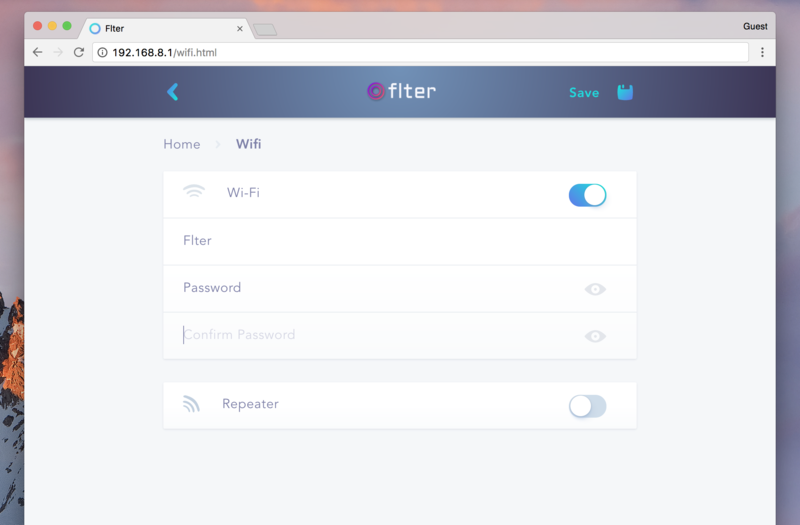 To change Flter’s WiFi password, simply select “WiFi” on the homepage, in the Password section, type in the password you wish to change it to. When prompted, confirm your selected password by retyping it in the “Confirm Password” input field. Select “Save” in the upper right-hand corner. Flter’s WiFi will reset, and you’ll then have to manually rejoin with the new password.